Suspended ceilings, also known as dropped ceilings, have become an integral part of the modern building architect. These are the secondary ceilings that are constructed to conceal pipes, ductwork, and wiring into the plenum. Simply put, a suspended ceiling can help to enhance the value of your home as it covers old and worn out the original ceiling. It gives a rather modern sophisticated look, which makes it suitable for both residential and commercial setups. There are numerous materials that can be used for the construction of a suspended ceiling. Some of the most commonly used materials include wood, plastic, and metal. Moreover, there is a wide range of new tile designs and ideas available for a suspended ceiling. You can choose the one that goes with the décor and theme of your room and give it a modern touch. Hiring professional suspended ceiling contractors for the installation can burn a hole in your pocket. However, you can opt for DIY methods for its installation. With some effort and time on your part, you will be able to give your room an altogether new look. 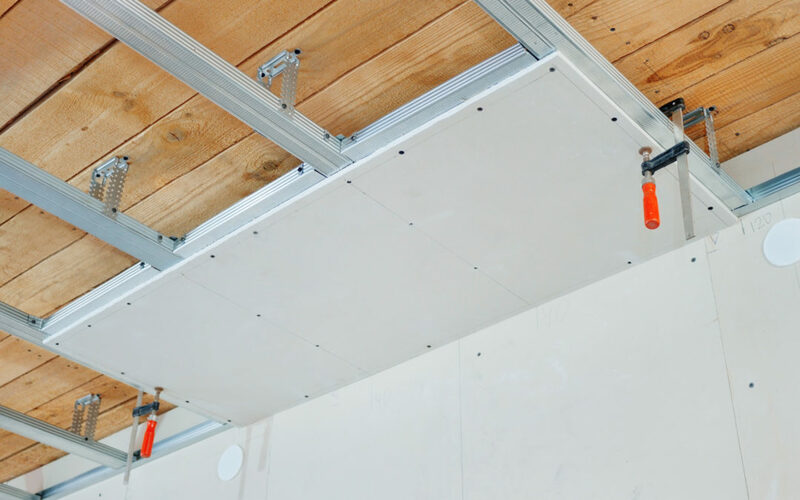 In this article, we have covered an in-depth guide on how to install a suspended ceiling in your home or office on your own for improving its look and appeal. Let’s have a look at its step-by-step procedure. The first thing you need to do, in order to install a suspended roof, is to draw the dimensions of your room. There must be no mistake in taking the measurements as it can lead to troubles during the later installation steps. You can use a graph paper to draw the dimensions. After taking the dimensions, you need to select a pattern between 2’ x 2’ and 2’ x 4’. The requirement of materials will depend on your selection of the pattern. You must also know the exact height for the installation of a suspended ceiling. A point to remember her is that there must be an adequate gap (3 to 4 inches) between your old and new roof. This phase of installing a suspended ceiling must be properly planned. It will serve as a base work for next-to-come phases. Therefore, you need to be very careful in this step. It is also recommended to sketch different layouts that can are possible to be constructed on your ceiling. The next step, after drawing dimensions, is to consider the lighting of your room. This step depends on your preferences i.e. the lighting you require in your room. For the installation of built-in lighting, you need to decide the location of light panels. These panels must be mentioned clearly in the drawing. Therefore, it will be easier for you to install lights in the later phase. There are numerous options available when it comes to selecting the type of lighting for your room. Evaluate all the options properly before selecting the best one for your room. Now, keeping in consideration the dimension of your room you have drawn, it is the time to know the wall angles. For this purpose, draw a line around your room using a level. After locating the wall angles, fasten them securely. You can use nails or screw anchors for this purpose. You must place the wall angle in a way so that its bottom is placed on the already drawn level line. It is advised to construct a temporary wooden mitre box for this purpose. In this step, you will have to install the necessary wires required for suspended ceiling and lighting. The order of installing wires usually depends on the type of lights you are opting for. For example, for recessed lighting, you need to place their wiring before the suspension wires. For the purpose of installing suspension wires, you must cut them into proper length at first. Ensure that main tees are located at right angles to your room’s joists. The location of main tees must be clearly identified in the sketch. Identify the place where the main tee and the first cross tee will meet; this is the place where you are going to install your first suspension wire. Attach this wire to your ceiling using screw hooks, nails or screw eyes. It should be made sure that each suspension wire is properly fastened. Do not forget to stretch each wire so that there are no kinks in it. Furthermore, there must be a suspensions wire attached along level guideline after every 4 feet distance. In this step, main tees are spliced. This is done if your room is wider than 12 feet. For this purpose, you need to determine the exact distance between the wall and the first cross tee. You can take help from the layout sheet drawing to get an idea of this distance. After measuring the distance, you have to locate the slot. Now, the next step is to measure back the same distance. At this point, subtract 1/8th of this distance for the purpose of wall angle’s thickness and cut the main tee. The positioning of cross tees must be done carefully. Consider the exact measurement of the room for installation of main tees. As discussed above, you must allow 1/8th of measurement distance for the purpose of the thickness of the angle of the wall. A point to remember here is that splices are accurately aligned. This is an important step to take of correct positioning of the suspension wires. If your main tees aren’t joined properly, there is a danger of them falling off. This step deals with the installation of main and cross tees. Use a long level for installing main tees. They should be installed in level to the wall angle. On the other hand, cross tees can be installed by inserting their ends in the slots you will find in the main tees. You can refer to the pattern selected to know about the location of the cross tees. Important Tip: You can take help of the manual containing manufacturer’s instructions in order to fit cross tees into their prescribed position. The last step in the process of installation of a suspended ceiling is the placement of its panels. You can do this by slightly tilting and lifting them above the framework. Then drop them in their prescribed position. There you go, after performing all these steps, you have got an all-improved ceiling for your room. This will not only enhance the value of your room but will also give it a modern and contemporary touch. This complete process is full of technicalities and detailing, therefore, a small mistake on your part can result in unfavourable results. We have compiled a list of handy tips and tricks that can come in really handy to complete this process without any difficulty. Read on to know these effective tips. Planning is the key here. While drafting a plan for installation of suspended roof, you must consider all the possible scenarios. Moreover, you must have adequate knowledge of using different tools and equipment required for installation. Carefully measure your suspension wires. Their length must be 12 inches more than the difference between your old and new ceiling. While drawing the sketch of your room, either use a main tee or a centred row of tile to bisect the room at the centre. For keeping the main tees straight while hanging, it is advised to use strings. Even if your wall looks straight or levelled, it is still recommended to take proper measurements and use a string to ensure all the cross tees are properly lined. Use drywall circle gauge and drywall saw for scribing holes and making the cuts respectively. If you have accidentally damaged a panel, there is no need to panic as it can be repaired using a white caulk. In case a panel has suffered greater damage, which cannot be repaired using a white caulk. You can use another one in its place. The damaged panel can be cut and used in a smaller area. Use quality material for installation for enhanced durability. Make a list of all the tools required for installation of a suspended ceiling in advance. If you are facing difficulties while placing the panels in the last step, try adjusting hanger wires. To sum it up, this process requires ample effort and time. However, the outcome you will get upon successful completion of this process will definitely be a satisfactory one. Apart from the improvement in your room’s look and appeal, it will also provide you an easy access to repair pipes, wires, and ducts hanging above. Moreover, as compared to the conventional ceilings, it will turn out to be a better sound barrier.